“Would you buy a used car off this man?” It’s the classic question of trust. “Buy one from a Brit who’s selling up and going home”. Really? Is that genuinely your suggestion? Buy a car from someone who a day later is going to be in another country and therefore really doesn’t care if they’ve sold you a pup? I don’t think so. “Buy one from a British-run car dealer on the coast”. Why? They’ve probably bought most of them from Brits moving back to the UK. Anyway, why would there be some unspoken automatic trust for a dealer simply because we speak the same first language? “Whatever you do, don’t buy off a Spaniard – they can’t be trusted.” Yes, sadly I must report that not only was this said to me in all earnestness, it was said by several different people (all British, I hardly need add). I was almost convinced that perhaps I was taking a risk. So I asked Frank to come along with me to listen to the engine and be my “back-seat expert” (mainly to show that I had someone who knew a bit more about cars). Frank brought his grand-daughter, aged 3, along. Always a good move! Antonio (the insurance) and his mum played with the little girl while we waited for Antonio (the car) to arrive. A bright red Seat Ibiza pulled up, and Frank, his grand-daughter and I piled in for a test drive. Four bits of information emerged. Firstly, Antonio (the insurance) had already told Antonio (the car) that I had begun to feel I’d set too low a target price and that I wanted air-conditioning. Secondly, Antonio (the car) turned out to be Antonio (the mechanic), who several people had recommended if today’s test-drive hadn’t turned out. Thirdly, Antonio (the mechanic) was going to put in a brand-new battery, replace the gear lever, and put the car through its ITV test (the Spanish equivalent of an MOT) in early September, to have it ready for me on my return. Fourthly, Antonio (the mechanic) is a good friend of Rafael who lives opposite me (and who is a good friend of Antonio from Arco del Sol), and Rafael had already told him that I’m a good neighbour and that he must get me a good reliable car. We zoomed off up the highway to test speed, brakes, and engine sound. All seemed fine. We shook on it. 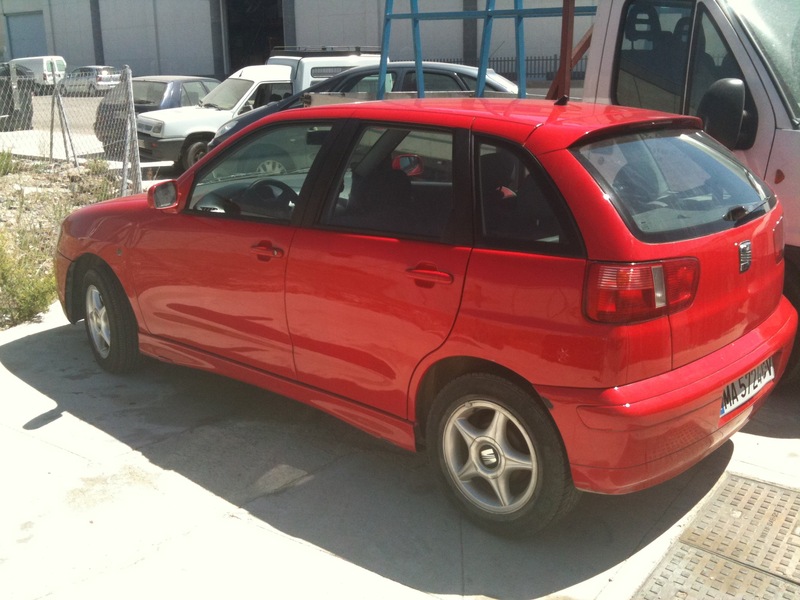 I now own a bright red Seat Ibiza. In the end trust is about two things. I refuse to trust someone JUST because they are British. I refuse to mis-trust someone JUST because they are Spanish. Both those are ridiculous positions to hold. I’d rather use instinct, and watch someone’s eye contact and general demeanour, and get my own feeling about whether he is trustworthy. And secondly I’d rather listen to my Spanish neighbours, who actively want to help me and want me to have a good experience of their village, and who have told me I can trust Antonio the mechanic. This entry was posted in Spain and tagged Andalucia, Colmenar, Spain, SpanishBlog by tamaraessex. Bookmark the permalink. Great decision criteria, i thought car sales man spoke the same language even if they dont speak the same language . They are a bit like lemons…. you can get a great one or a lemon… at some point there has to be trust even if a car comes brand new out of the sales room so go with your instincts and contacts. Mostly if you treat people well you get back the same and your new community will all delighted that they have someone who isnt measuring them against a little England yard stick. Am so enjoying your blogs, can feel the type of place you live in as my cousin is married to a spaniard Juan torres Gonzales, she has been there since we were 17 and lives in Menorca. Have had many memorable times with her and extended spanish family.